The Estria Foundation will sponsor 2 weeks of cultural happenings and curated events for the community of Oakland and beyond. 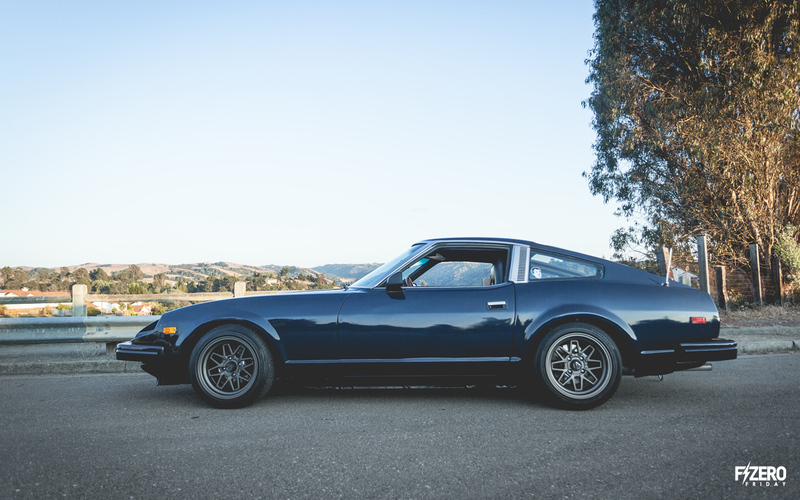 September 24, 2013–Oakland, CA. The Prism: Urban Art and Culture Festival encompasses a series of public events organized by The Estria Foundation. Oakland boasts world-class sports teams, rich urban culture, a ranking as the nation’s most sustainable city, a booming start-up company and non-profit hub, and a thriving art scene. Contributing to Oakland’s creative culture, civic enthusiasm and love of community events, Prism: Urban Art and Culture Festival will feature an array of activities beginning on September 28 and running through October 12th. These events will address social justice concerns utilizing visual art, music, dance, symposia and sustainable culture practices in an effort to emphasize live art projects and arts programming for the community. Prism: Urban Art and Culture Festival aims to engage Oakland residents and visitors in a dialogue that will galvanize a creative and holistic approach to community. Concurrent with Prism’s event schedule, October 12th will highlight the return of The Estria Battle, an all day arts event at the historic DeFremery Park (Lil’ Bobby Hutton Park). This is a free, family-friendly event with a focus on public art and environmental sustainability. Youth are invited to participate in a series of arts activities including the Blackbook Battle and the t-shirt Stencil Workshop. Attendees are also welcomed to enjoy a range of artistic performances and are encouraged to participate in generating energy by dancing on the “Pedal Powered Stage” which transforms human exuberance into pure energy. 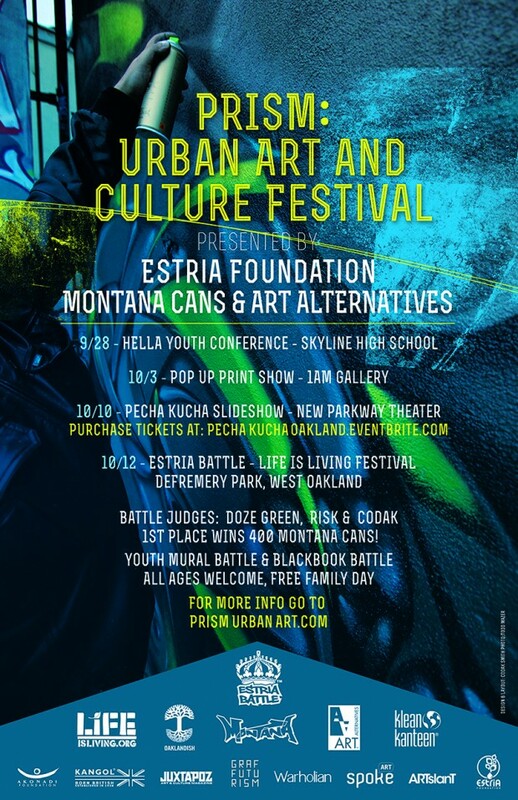 In its sixth year the Estria Battle remains the premier graffiti art competition in the United States. 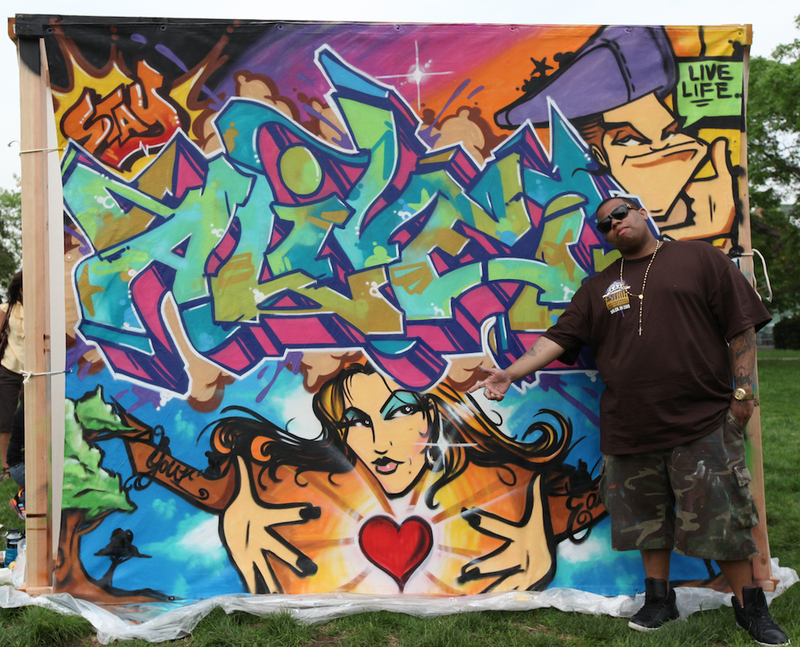 Sixteen renowned artists from across the country will compete in what has become one of the nation’s most talked about spray art events. The panel of judges will be Doze Green, Risk and Codak. Returning artists are 2011’s 1st and 2nd place winners, Vyal One from Los Angeles, and Doves from New York City. Besides several local Bay Area artists, other contestant artists will be traveling from Chicago, Austin, and Miami. 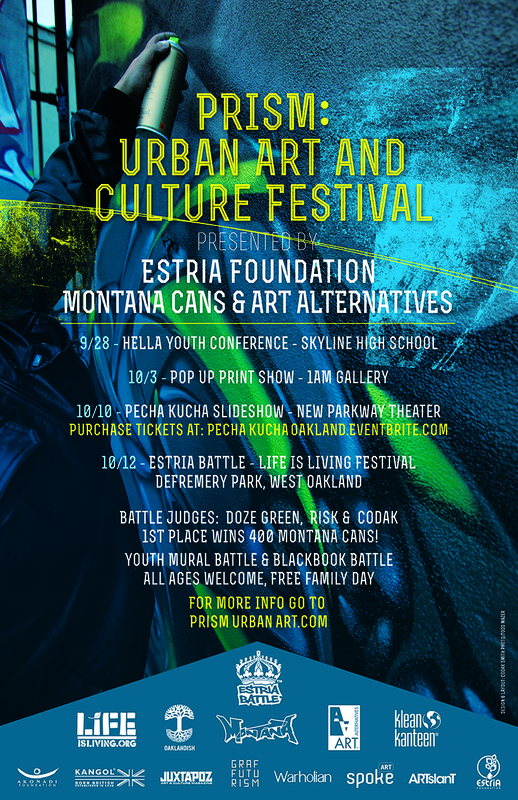 The Estria Battle encourages graffiti writers to visually articulate social justice issues by empowering communities with the spirit and beauty of public art. These events aim to elevate street art through community building, public education, and engagement. How does the Estria battle work? • Artists are invited to the competition based on skill level and their foundation in spray can art. • Artists are given 5 hours to complete a piece based on a word that is revealed at the beginning of the competition. • An 8 x 12 ft. canvas is assigned to each artist with a limited amount of spray cans and colors which are distributed equally amongst competitors. • After 5 hours, the piece (finished or unfinished) is judged by legendary graffiti writers, and the champion is announced at the end of the Battle. 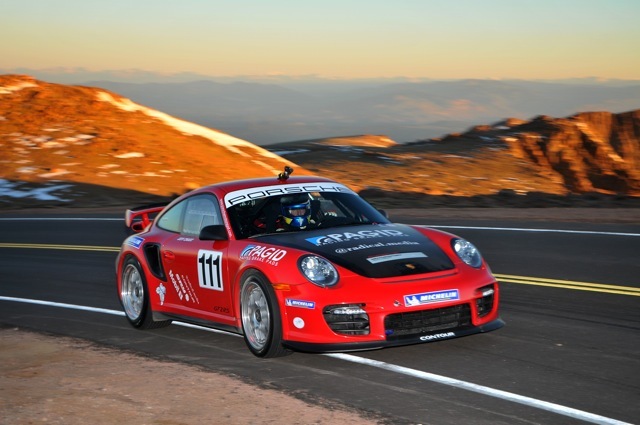 1st Place winner will win 400 cans from Montana Cans. 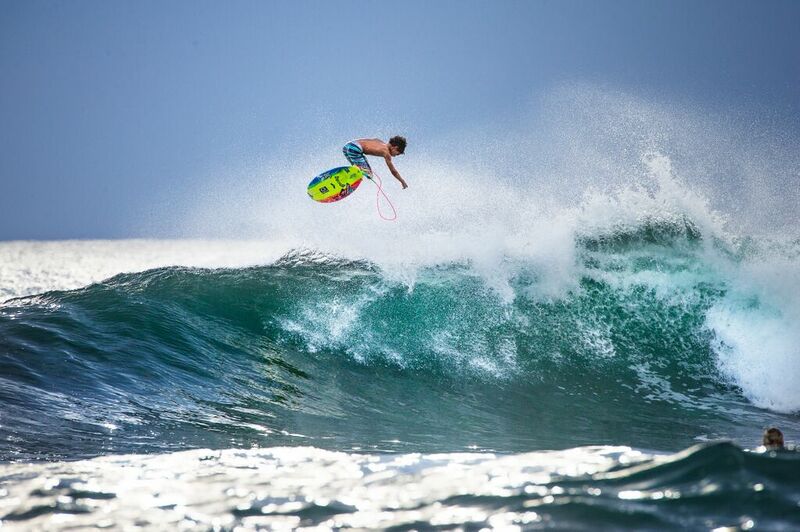 This year’s festival marks a significant extension in its curatorial program from previous years. Apart from the works created and exhibited on October 12th, Prism: Urban Art and Culture Festival will host a diverse program of symposia, workshops and a gallery exhibit that complement the one-day festival. A complete list of related events is below. 400 students from Bay Area high schools will attend a conference dedicated to the intersections of social justice movements and the 4 elements of Hip Hop culture. The Estria Foundation is curating the visual arts track to provide visual arts workshops to youth who are interested in developing their voice through urban arts. The conference is free and open to youth from 9:00am to 4:00pm at Skyline High School, presented by Youth Together, All the Way Live, The Estria Foundation, Beats Rhymes & Life, and ScratchPad. 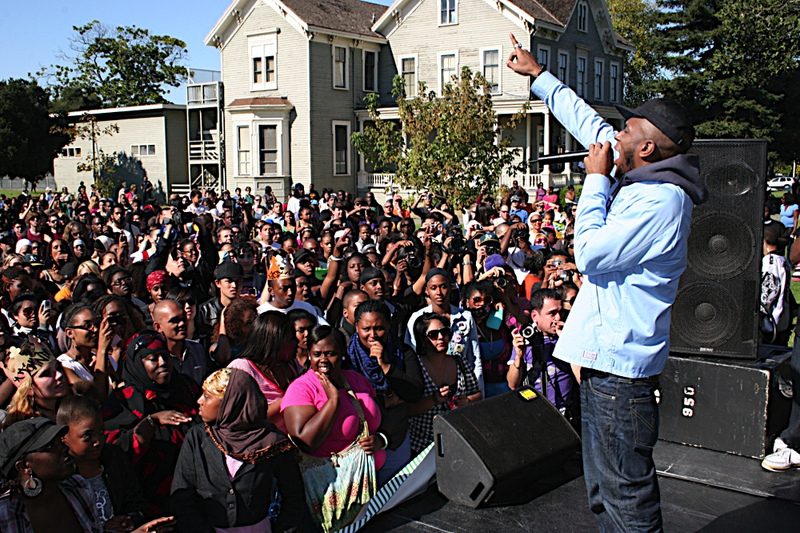 October 12th ~ The Life is Living Festival at Defremery Park presented by the Estria Foundation and Youth Speaks, 16th St & Adeline St., West, Oakland, CA 94607 All ages, free admission. Stencil Workshop: A youth-focused interactive arts education activity where participants select positive images and spray paint them on t-shirts, creating an original design. Blackbook Battle: Youth ages 14-21 create a drawing based on the day’s theme. Mentor artists judge the competition and provide positive feedback and supportive critiques. The first 50 participants receive a free sketch “blackbook” to take home. 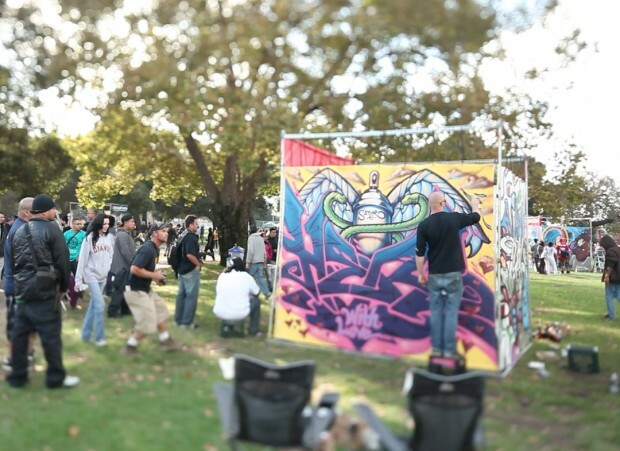 Youth Mural Battle: A live painting and visual storytelling competition featuring prominent young visual arts organizations from the Bay Area, Southern California, and Arizona. Contestant teams use mixed media of acrylic paints, markers and spray paint to develop murals addressing a given topic. 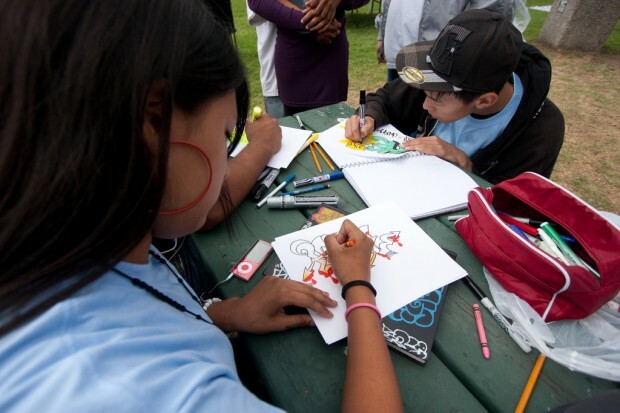 Winning canvases will be displayed at the Oakland Public Library’s “Teen Zones” where free urban arts workshops will be held for youth through March 2014. The Yerba Buena Center for Arts will be hosting the the Dance Stage with music from Samba, East and West African dance traditions. Skateboarding demonstrations at Town Park, workshops, and competitions for all ages and skill levels.Food vendors and booths from non-profit groups and sponsors. The Estria Foundation creates art in public spaces locally and globally. We collaborate with communities on creative projects that raise awareness and inspire action in the movement to advance culture and to resolve human and environmental issues. The Estria Foundation (TEF) is a non-profit organization working to create social change through the creation of art. It is dedicated to creating lasting systemic social change by empowering local communities to work collectively and participate in our global network. We work towards a society that places value on people and the environment above the accumulation of wealth. LIFE Is LIVING is a national campaign of Youth Speaks Inc. that generates partnerships between diverse and underserved communities, green action agencies, local community groups, urban environmental activists, and the contemporary arts world. Life is Living encompasses a series of six-hour interdisciplinary, intergenerational, eco-equity festivals in neglected parks in underserved neighborhoods around the country. Previous cities include Oakland, CA, Harlem, NY, and Chicago, IL and Houston, TX. The MONTANA brand has been influencing artists since its humble beginnings in Heidelberg, Germany. 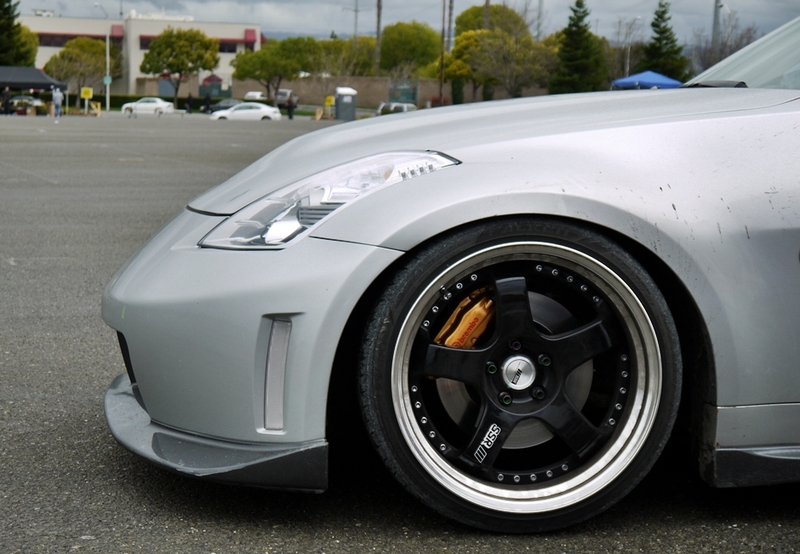 The team behind the brand has its roots in Urban Art and Culture, and are still active users. The love for Urban Art and creativity in all forms is extended by the continuous support of artists and creative events worldwide.